​Cold days call for warm, hearty comfort food and, today I have the perfect recipe for you. 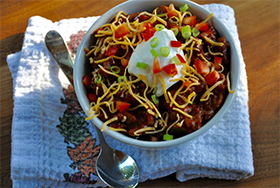 This Meaty Comfort Chili has all of the warmth, flavor and comfort that you could ask for in a healthy dinner. This recipe tastes even better the next day! Heat a large heavy bottomed pot over medium-high heat. Add the sausage, onion, bell pepper, garlic, ground beef and jalapeno to pan; cook 8 minutes or until sausage and beef are browned, stirring to crumble. Add chili powder, coconut sugar, cumin, tomato paste, oregano, black pepper, salt and bay leaves and cook for 1 minute, stirring constantly. Stir in wine, tomatoes, and kidney beans; bring to a boil. Cover, reduce heat, and simmer 1 hour, stirring occasionally. Uncover and cook for 30 minutes, stirring occasionally. Discard the bay leaves. Sprinkle each serving with the garnishes. Spread the word. Use the “refer a friend” link below to forward this newsletter to your friends, family, and coworkers.